Partnerships with K-16 schools include student-directed project building residencies, community education classes, field trips, and family nights. Content can be tied to academic standards or enrichment. Leonardo’s Basement will bring design, build and experiment project building to you. 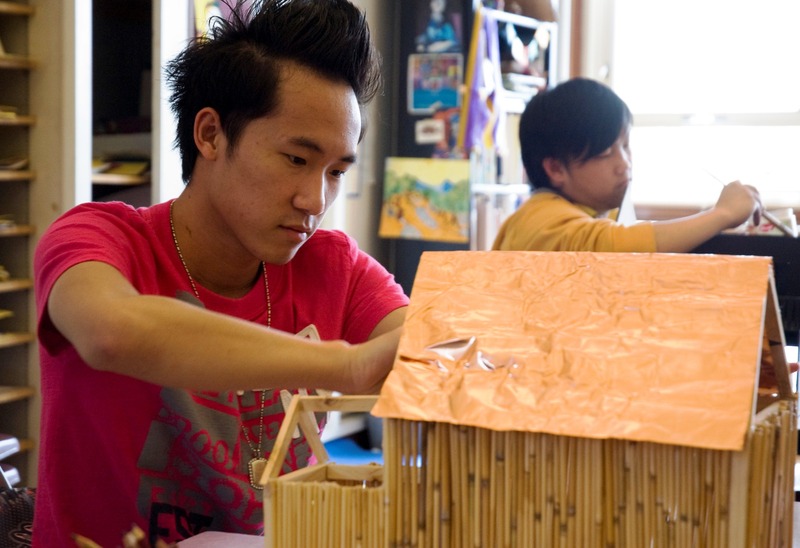 Applied math, physical science, sculpture and engineering projects are common. We will work with you to provide the specific experiences and academic support that your students need. Our workshop has hundreds of tools and a warehouse full of building materials. Schedule a field trip to develop technical skills, explore the design/build process, make sculptures and have fun. Our informal project-based learning environment is particularly well-suited to help young people develop 21st Century Skills. We suggest a minimum 1.5 hour visit. Bring 10 – 150 students. The cost is $10/hour/student. Leonardo’s Basement rarely provides after school programming off-site. However, after school programs are encouraged to visit our workshop on school days, school release days, and during summer programs. Contact us to design the perfect project building activity for your next family event. Engineering, art, math, experiments and games can be connected to a specific event theme or ask us to fill a gap in your existing activity offerings. The cost is $3-5/person. Schedule an engineering, art or technology workshop for children, teens, adults or families at your library. We bring project building workshops to parks, community centers, corporations and other private and public events. Scouts and childcare groups are encouraged to schedule field trips. Leonardo’s Basement hosts the annual Minneapolis/St. Paul Mini Maker Faire at the Minnesota State Fair Grounds in June. Over 200 artists, inventors, designers, students, scientists, engineers, woodworkers and others bring projects to share with 10,000 visitors at the family event. Leonardo’s Basement provides year-round, inventive workshop classes to help people of all backgrounds and ages apply the powers of imagination, curiosity, problem solving, and risk taking to create engineering, art, and technology projects.